The U.S. postal code for Haleʻiwa, including Kawailoa, is 96712. Haleʻiwa is located at 21°35'24" North, 158°6'50" West (21.590050, -158.113928), southwest along Kamehameha Highway (State route 83) from Pūpūkea. At Haleʻiwa, Kamehameha Highway becomes state route 99 (at the traffic circle known as "Weed Circle"), which runs eastward up across the Oʻahu central plateau to Wahiawā. A new bypass route (Joseph P. Leong Highway) avoids both the traffic circle and Haleʻiwa, extending state route 83 to just north of Haleʻiwa town. Haleʻiwa Road and both Kaukonahua Road and Waialua Beach Road from Weed Circle go south and southwest into Waialua across Paukauila Stream. 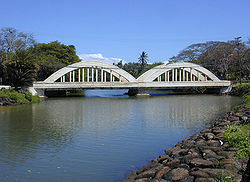 "The historic Rainbow Bridge over the Anahulu River marks the northern entrance to old Haleiwa Town. There you will find small shops, eateries and many galleries. Two beach parks surround the small boat harbor located in Waialua Bay, Haleiwa Beach Park located to the north and Haleiwa Alii Beach Park located to the south." According to the United States Census Bureau, the CDP has a total area of 3.0 square miles (7.7 km2). 2.3 square miles (5.9 km2) of it is land, and 0.69 square miles (1.8 km2) of it is water. The total area is 23.67% water. In 1898 a businessman named Benjamin Dillingham opened a hotel in the North Shore area and named it Haleʻiwa. In the Hawaiian language, hale means "house", and the ʻiwa is a frigatebird. He also built a railway line from Honolulu to Waialua along the west coast around Kaena Point, which opened the same year and ended in front of his hotel. The railroad inaugurated a passenger train, the Haleiwa Limited, which took two hours for this trip. This railroad was chartered as the Oahu Railway & Land Company. Hale'iwa was designated a State Historic, Cultural and Scenic District in 1984 by the City and County of Honolulu. All new buildings must adhere to a design plan that reflects the territorial architecture of Hale’iwa’s earlier sugar industry period. The town is home to 30 historic buildings featuring plantation architectural styles influenced by the Waialua Sugar Co. The 16th Coast Artillery's Battery F was assigned to four 8-inch M1888 railway guns that were located nearby on specially made spurs. These railway guns were soon dismounted and designated as Battery Kahuku. On December 7, 1941, two P-40B fighters, piloted by George Welch and Kenneth M. Taylor, managed to scramble against the Japanese attack on Pearl Harbor, taking off from the now-abandoned Haleʻiwa Airfield. As of the 2000 Census, there were 2,225 people, 770 households, and 525 families residing in the CDP. The population density was then 469.4/km² (1,218.1/mi²). There were 867 housing units at an average density of 474.6 per square mile (182.9/km²). The racial makeup of the CDP was 24.63% White, 0.49% Black or African American, 0.31% Native American, 28.85% Asian, 9.98% Pacific Islander, 0.81% from other races, and 34.92% from two or more races. 10.29% of the population were Hispanic or Latino of any race. In the CDP the population was spread out with 26.2% under the age of 18, 9.7% from 18 to 24, 27.2% from 25 to 44, 24.6% from 45 to 64, and 12.3% who were 65 years of age or older. The median age was 36 years. For every 100 females, there were 103.6 males. For every 100 females age 18 and over, there were 101.1 males. The median income for a household in the CDP was $39,643, and the median income for a family was $48,553. Males had a median income of $31,750 versus $25,163 for females. The per capita income for the CDP was $16,504. 17.6% of the population and 15.0% of families were below the poverty line. Out of the total population, 26.2% of those under the age of 18 and 6.7% of those 65 and older were living below the poverty line. The Hawaii Department of Education operates public schools. Haleiwa Elementary School and Sunset Beach Elementary School are in the CDP. Matsumoto's Shave Ice, a local island favorite, is located in Haleiwa town and sells Oahu's most popular shave ice. It has been open for over half a century, and is open seven days a week from 9:00AM to 6:00PM. "Haleiwa Beach Park provides a plethora of possibilities including surfing lessons which are offered year round by Uncle Bryan's Sunset Suratt Surf School and the North Shore Surf Girls and is walking distance from shopping, eating and sightseeing in historic Haleiwa Town." Haleiwa Harbor is also a popular destination for stand-up paddle boarding. Winter months bring large waves to Haleiwa. Surf tourism is a popular attraction in Haleiwa. ^ "Profile of General Population and Housing Characteristics: 2010 Demographic Profile Data (DP-1): Haleiwa CDP, Hawaii". U.S. Census Bureau, American Factfinder. Retrieved May 17, 2012. ^ "Haleiwa info". Hawaii Beach Rentals. Retrieved 15 November 2012. ^ "Geographic Identifiers: 2010 Demographic Profile Data (G001): Haleiwa CDP, Hawaii". U.S. Census Bureau, American Factfinder. Retrieved May 17, 2012. ^ George Woodman Hilton: American Narrow Gauge Railroads, Stanford University Press, 1990. ^ North Shore Oahu, Haleiwa. Retrieved 18 June 2017. ^ "Coast Defense Study Group". www.CDSG.org. Archived from the original on 25 January 2010. Retrieved 21 November 2012. ^ "Dillingham Field". Hawaii Aviation archive of historic photos and facts. State of Hawaii Department of Transportation, Airports Division. Retrieved 2009-11-17. ^ "Haleiwa CDP, Hawaii." U.S. Census Bureau. Retrieved on May 21, 2009. ^ Noriko, Matsumoto. "Matsumotos Shave Ice". Biso. Retrieved 13 July 2018. ^ Borders & Bucket Lists (2018-08-22). "The Ultimate Guide to the North Shore, Oahu". Borders & Bucket Lists. Retrieved 2019-01-22. ^ "A Small Child, a Big Board, on Oahu's North Shore". New York Times. ^ "Armitage, Kimo 1968- [WorldCat.org]". www.worldcat.org. Retrieved 2019-03-18. Wikimedia Commons has media related to Haleʻiwa, Hawaii.